With the World Championship-winning HB D8 buggy as its foundation, the Vorza takes the race-winning design of the D8 and mixes it up with HPI Flux HP technology from the Savage Flux HP to give you awe-inspiring speed! This is a ready to run (RTR) buggy that you can take to your local BMX jumps for hair-raising big-air thrills and then take it straight to any RC track for top-level racing action – it will turn heads and amaze your friends! The Vorza has everything that backyard bashers and racers want! 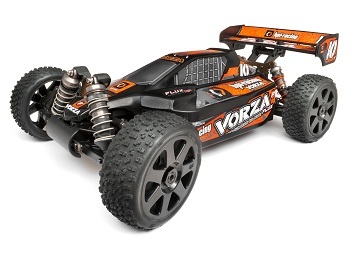 The Vorza Flux HP is our FASTEST 1/8th scale buggy, able to reach speeds up to 73 mph*! The Flux Blur electronic speed control takes 2 batteries, allowing you to fit in up to 6S of LiPo power for utterly insane top speeds and mind-boggling take-off power! With many parts taken directly from the World Champion HB D8 racing buggy, the Vorza is ready to hit the track any time, any place! Equal-length 16mm HB Big Bore shocks smooth out the ride and provide plenty of adjustment, while the D8’s solid suspension arms, knuckles and uprights take the pounding of jumps, dips and landings. Sturdy aluminum suspension mounts securely hold the suspension arms to the chassis with a steel screw and washer. At both ends of the car, the Vorza has everything you’d expect from an all-out competition kit, including HB’s Inverse Steering Block Design, thick anodized aluminum steering link, optional hinge pin holes for the rear uprights, adjustable roll center, thick turnbuckle links, aligned king pin and universal joint pivots, sway bar, steel turnbuckles and HB’s own counter-rotating shock mount screws. Continuing the rugged reliability of HB nitro buggies and truggies, the Vorza uses the D8 spiral-cut ‘worm gear’ diffs to get the power from the driveshafts to the wheels. A spiral cut is more reliable and much stronger than standard straight-cut gears, giving you extra confidence and fewer maintenance headaches. You can adjust the diff action with thicker or thinner oils because all three diffs are sealed against leakage, giving you a fantastic boost of tuning ability! Providing the power for the Vorza Flux HP is an HPI Flux brushless system, consisting of the Tork 2200 motor and Blur speedo – both wholly impressive in their own right, but together they form an unstoppable power force! The Flux Tork 2200 features the coolest motor cases we’ve ever seen, with massive machined cooling fins that really make it look the part of an all-out power plant! With a 5mm motor shaft it can fit the upcoming optional pinion gears so you can get even MORE top speed for those insane runs, or gear it down a bit for increased acceleration on the track. The Tork 2200 is held down to the 3mm 7075 aluminum motor plate with two 8mm billet machined aluminum clamps so it won’t move or shift under the immense amount of torque it can pull. Controlling the Tork 2200 is the Flux Blur speedo, the most powerful brushless speed controller we could find. With the ability to handle twin 3S LiPo batteries (that’s a total of 6S LiPo power!) it can deal with anything the Tork 2200 motor can dish out! 6mm bullet connectors secure the motor wires for loss-free connection to the 12-gauge wires, and to connect to each battery pack we’ve attached industry standard Dean’s connectors for zero power loss and total efficiency. We figured why re-invent the wheel and release our own connector when the best is already available? Topping off the versatility of the Flux Blur speedo (literally) is an integrated cooling fan, which allows the electronic speed controller to operate at its ideal temperature. HPI makes it as easy as possible to get into RC racing action. The RTR Vorza Flux HP is completely pre-built and ready to go right out of the box! Everything is assembled and tuned for you by professionals – diffs, shocks, suspension and more are perfect before you even open the package. You don’t have to do a thing to get going fast! HPI Ready-To-Run vehicles bring you the same high performance and quality that you’d expect from a high end RC kit but with the added convenience of being factory pre-assembled to the highest standards – giving you a high performance RC car straight from the box! As with all HPI cars and trucks, you get a full, in-depth instruction manual with step-by-step instructions that allow you to easily disassemble and reassemble your truck for maintenance and easy servicing. The manual also includes a handy parts list and full-scale drawings of the parts and hardware. The included HPI RC Car DVD is your personal RC car expert in a box!